What does a title plan show? Boundary definitions: Can I use the title plan to measure to my boundary from the side of my house? the exact positions of the boundaries of the land in that title. This page explains the limitations of title plans. For an explanation of the limitations of the Ordnance Survey maps on which Land Registry's title plans are based, see Using Ordnance Survey maps. Land Registry does not define property boundaries. Land Registry compiles and maintains a register of titles to land. The boundaries of each registered title were created by the landowner who divided his land in order to sell off a part of it. There are no laws or regulations governing the standards by which the boundaries are described by the seller/vendor/transferor or by his or her conveyancing solicitor or estate agent: and it is usually not known which of these people made the original description of the boundary. 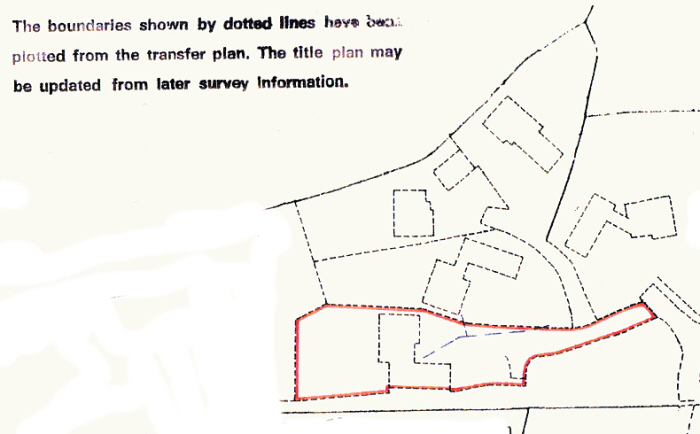 Does my Land Registry title plan define the exact lines of my boundaries? Land Registry plays no part in deciding where boundaries are located; that decision falls to the owner of a larger piece of land who divides his land in order to sell the divided-off part. Land Registry's title plan is but an interpretation of the transfer deed that attended the division and sale of the land: the title plan is not the primary source for the description of the boundary. 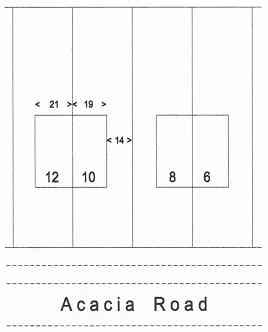 Can I use the title plan to work out the exact position of my boundary by scaling the distance from the boundary to the side of my house? Firstly, the title plan is based upon the Ordnance Survey map, and as to the accuracy limitations of the Ordnance Survey map, one need only consult the table of relative accuracy of Ordnance Survey maps to appreciate how dangerous it might be to scale a distance from a title plan. Moreover, there is a warning in red text at the foot of the title plan that states: This title plan shows the general position, not the exact line, of the boundaries. It may be subject to distortions in scale. Measurements scaled from this plan may not match measurements between the same points on the ground. Surely title plans must be right as they are backed by the national land registration authority and by the national mapping authority? Land Registry is required by Section 60 of the Land Registration Act, 2002 to show only the general position of a boundary. Section 12 of the Ordnance Survey Act, 1841 decrees that Ordnance Survey maps "shall not extend, or be deemed or be construed to extend, to ascertain, define, alter, enlarge, increase or decrease, nor in any way to affect, any Boundary or Boundaries of .... any Land or Property". By law, Land Registry is required by Section 60 of the Land Registration Act 2002 to show only the general positions of the boundaries of the land in a registered title. Ordnance Survey maps are prevented by Section 12 of the Ordnance Survey Act 1841 from showing property boundaries. There are also issues concerning the accuracy of Ordnance Survey maps. This title plan shows the general position, not the exact line, of the boundaries. It may be subject to distortions in scale. Measurements scaled from this plan may not match measurements between the same points on the ground. Two (fictitious) examples of title plans, showing how they relate to their corresponding title registers, are given in Land Registry Practice Guide 40, supplement 5: Land Registry Plans: title plan. You will also find at Appendix 1 to that supplement a diagram explaining the scheme of colours that Land Registry employs in compiling a title plan. 1. Land Registry is NOT responsible for deciding where to place the boundaries that divide individual parcels of land. That responsibility falls to the owner who divided the land into the present parcels. 2. The description of the boundary given in the title deeds produced by or for the vendor is usually sadly wanting: see Boundary Descriptions, and Conveyance Deeds and Plans. It is the poor standards of boundary descriptions in conveyances that forced Land Registry to adopt the principle of recording only the "general boundary" as early as 1875. See the article 100 years of OS/LR Co-operation. 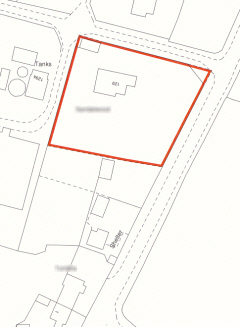 The boundary of a registered estate as shown for the purposes of the register is a general boundary, unless shown as determined under this section. 4. The red line shown on the title plan is not the 'general boundary' but is edging placed along the inside of a black line on the Ordnance Survey map, and it is this black line that carries the 'general boundary'. 5. The Ordnance Survey map is a map of the physical features of the landscape and is a map that was made without enquiry as to the positions of property boundaries. So the line used as the general boundary is a physical feature and the exact relationship between the boundary and the physical feature is unknown. 6. The Ordnance Survey map is known to contain small errors. There are also issues relating to selection and generalisation of the features, and these factors have an effect upon the relative accuracy of the map (see Using Ordnance Survey maps, where you will also find an Example of confusion arising from map generalisation). 7. Sometimes developers build and sell houses faster than Ordnance Survey is able to survey them. In such instances Land Registry has based its title plans on the developer's transfer plans. As we have seen, at Developer's layout plans on the "Conveyance Deeds and Deed Plans" page, such transfer plans are often a statement of the design intentions rather than a record of what was actually built. Such transfer plans are likely to be particularly misleading as the example further down this page also deomonstrates . 8. The title plan identifies the land in the registered title and it gives only a general indication of the position of the boundaries of that land. In rare cases (and this will be noted on the register) either a boundary agreeement or a determined boundary will affect the registered title, and it is only via such a boundary agreement or determined boundary that Land Registry is able to tell us the exact position of the boundary. (south) along the southern of two parallel features; (east) along a fence, along the flank of the house, across open plan front garden. 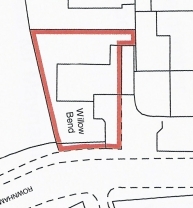 Part of the title plan for the developer's land from which the land sold off as new houses (including the house at left) has been excluded. 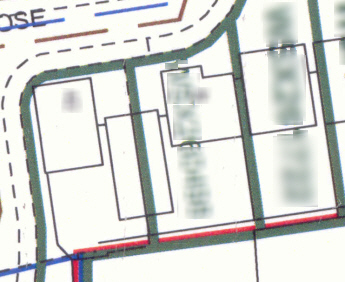 Each excluded land parcel is indicated by green edging, and its title number (blurred in the above example) is also shown in green. To avoid a clash of red and green edging, the green edging is sometimes shown to the outside of the general boundary to which it draws attention. "This title plan shows the general position of the boundaries: it does not show the exact line of the boundaries. Measurements scaled from this plan may not match measurements between the same points on the ground.". "NOTE: T-marks affect the eastern and southern boundaries of the land in this title". Boundary definitions: Can I use the title plan to measure to my boundary from the side of my house? When I do so I find that the fence is nearer to my house than the title plan says it should be. Am I right in thinking that my neighbour must move the fence? This is, sadly, a common error. Firstly, Land Registry is not responsible for specifying where the boundary should be: that is the responsibility of the owner who divided the land into its present parcels. It is Land Registry's duty to show only the general position of the boundary. Secondly, the Ordnance Survey map on which the title plan is based is not a perfect representation of the real world (see Using Ordnance Survey maps): scaling distances from it produces misleading results and cannot, legally, identify the boundary’s position. The example of the fictitious Acacia Road, illustrated in the drawing at right, demonstrates that distances scaled from a title plan cannot be relied upon. The owners of 10 Acacia Road scaled from the title plan a distance of 14 ft feet between the side of their house and the boundary. Outside, they measured with a tape a distance of only 13 feet. Armed with this information they accosted the owner of No 8, telling him that his fence was in the wrong position and that he must re-erect it in accordance with the position of the boundary as shown on the map. For another example of a misunderstanding of a title plan, or rather of the Ordnance Survey map on which the title plan is based, see Example of confusion arising from map generalisation on the Using Ordnance Survey maps page. The depiction of road frontage boundaries appears to be a particular problem for Land Registry. With public highways, the surface of the land is vested in the Highway Authority (which is usually the County Council) whilst the adjoining land's boundary might be in the centre of the road. Land Registry is unable to show that boundary in the centre of the road because of other interests that may exist in the surface of the road. So far so good. But Land Registry automatically assumes that the highway extends to include all footpaths and verges lying alongside the carriageway of the highway. Sometimes it does, sometimes it doesn't. In the photo above, the highway authority and the adjoining landowner agree that the boundary between the road (public highway) and the adjoining unregistered land is located at the junction between the footpath and the grass verge. It will be interesting to see where Land Registry places the general boundary when an application for first registration is made. 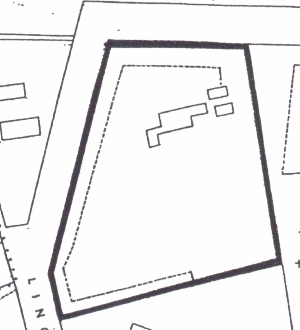 Land Registry's past form suggests that they will place the general boundary on the brick wall. The 1970 conveyance plan is shown at left, and the title plan issued on first registration (in 2010) is shown at right. 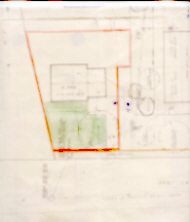 The green tinted front garden of the conveyance plan abuts a brown tinted private footpath (later adopted as public highway) whilst the title plan shows the part of the green tinted area that falls outside of the wall (which was built in about 1987) as if it is not part of the land in the title. The point to understand here is that Land Registry prefers to place the general boundary along the solid line on the Ordnance Survey map (in this example, the wall) even though it has incontrovertible evidence (the conveyance plan) that the boundary runs along the dashed line on the Ordnance Survey map (in this example, the junction between the paved footpath and the grass verge / shrubbery). The following examples represent the typical treatment of the general boundary at a road frontage. 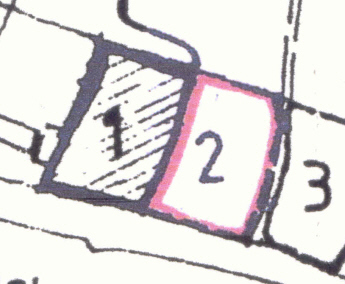 In the example below, the deed plan (left) shows that the building plot numbered '2' extends to the edge of the carriageway. In spite of this, Land Registry has excluded the verge, even though the verge was created at the time the house was built. Land Registry is resisting amending the title plan even though the registered proprietor has received written notice from the Highway Authority that it is not responsible for the verge. With private roads also, the title plans appear to confuse. Figures 5 and 6 in the Digital Boundaries in Eng& Wales article (see also below) show a private road that runs along the western and northern sides of the land to which the two illustrations relate. 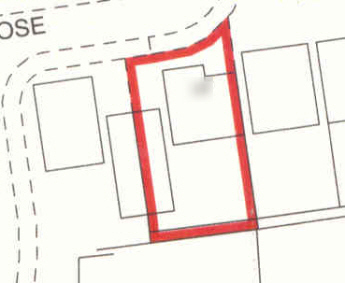 The property boundary is clearly located in the centre of the road but the title plan shows the general boundary along the fence line. In practice the private road comprises a narrow carriageway between broad grass verges, and the local residents have formed a road fund committee charged with keeping the carriageway in good repair. Land Registry would have been unaware of the existence of the road fund committee, and that committee in any case holds no legal interest in the private road. So there would seem to be little justification for Land Registry to show the general boundaries at the edge of the private road rather than in its centre. In the example below, there is clearly a line on the Ordnance Survey map that better reflects the position of the boundary than the line chosen by Land Registry to represent the general boundary. This is again a private road and the circumstances make it clear that the carriageway of the private road is in separate ownership from the verges on either side. 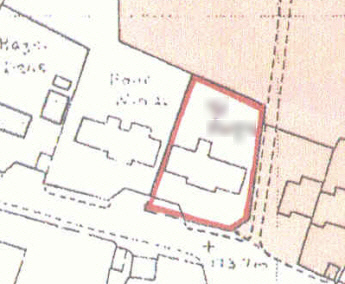 Land Registry title plan of the same property: note that the southern verge of the road is shown outside of the general boundary. The obvious inference of the preceding examples is that you should assume that Land Registry's general boundary at the road frontage is shown in a position that differs from the true position of the boundary. Let us return to the example of Developer's layout plans on the "Conveyance Deeds and Deed Plans" page. This is one of those examples where new properties were built, sold and registered before Ordnance Survey was able to put them on their map. Land Registry was forced to base the title plans on the transfer plans. As we have already seen, these transfer plans were based on design plans and do not represent what was actually built. Below is an extract from the title plan for one of those properties. Based upon the above title plan, I have created a number of coloured polygons, each colour representing the land within a separate title as defined by the general boundary. Onto these coloured polygons I have overlaid my own survey of what was actually built on the ground. The physical boundary, and thus the true boundary, between the orange and the blue properties was built further west than the design plans indicated. 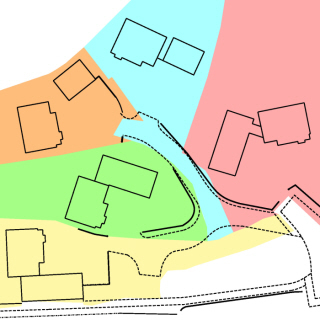 Be very wary of title plans that are based on design plans: the general boundaries are very likely to be located in some other position than the true position of the boundary. It is Land Registry's practice when creating a new title plan to attempt - as a desk exercise - to reconcile to the Ordnance Survey map the information submitted with an application for first registration. Only if they encounter a complication will they send someone out to site to resolve the complication. The case that is illustrated at Example of a General Boundary on the "Understanding General Boundaries" page demonstrates how an inaccurate title plan can result when a transfer plan is taken at face value with no ground check as to whether it reflects what is actually on the ground. It also demonstrates the misunderstanding to which landowners can fall prey when they place too much reliance on the general boundary shown on an inaccurate title plan. As a reminder of what happened in that case, one company owned a parcel of land stretching along the west side of one road, all the way from one road junction to the next road junction. That company decided to split its land into two, and marked the division between the two with a fence. When the smaller, northern part of the land was sold, a transfer plan was drawn up. 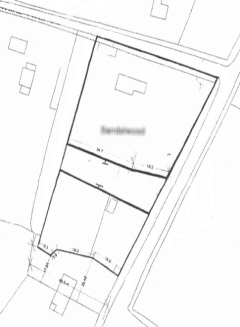 The transfer plan was based on an Ordnance Survey map, but the fence was not shown on the Ordnance Survey map and the vendor mistakenly used a map grid line to represent the southern boundary of the land that was being sold. When drawing the title plan, Land Registry took the information it was given and placed the general boundary along the grid line. The general boundary does not represent the true line of the boundary, which of course follows the line of the fence. 2. Land Registry's practices do not always identify those erroneous boundary descriptions - that require on site investigation - in the deeds submitted to them for first registration of title, with the result that title plans sometimes perpetuate the errors. 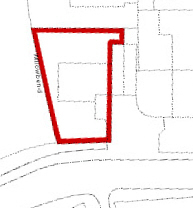 Land Registry title plans do not show the exact line of the boundary. Land Registry is NOT responsible for defining property boundaries. See all of Land Registry's blog posts since 24 Feb 2014. This series brings together all HM Land Registry guides relating to plans. The information given on this web site is of necessity of a very general nature and cannot be relied upon to meet your specific requirements. Neither Jon Maynard FRICS nor Jon�Maynard Boundaries Ltd can be held responsible for any action that may or may not be taken by anyone who accesses this site and acts on the basis of any information found within. Whilst it is hoped that the reader may gain benefit from the information in this site, liability can only extend to specific advice given by Jon Maynard FRICS after completion of a formal engagement letter.